Many tens of thousands of mental health and health care professionals have used this essential training resource—now significantly revised with 70% new content reflecting important advances in the field—to develop and sharpen their skills in motivational interviewing (MI). Clear explanations of core MI concepts are accompanied by carefully crafted sample dialogues, exercises, and practice opportunities. Readers build proficiency for moving through the four processes of MI—engaging, focusing, evoking, and planning—using open-ended questions, affirmations, reflective listening, and summaries (OARS), plus information exchange. In a large-size format with lay-flat binding for easy photocopying, the volume includes more than 80 reproducible worksheets. Fully revised and restructured around the new four-process model of MI. Chapters on exploring values and goals and "finding the horizon." Additional exercises, now with downloadable worksheets. Teaches how to tailor OARS skills for each MI process. Integrates key ideas from positive psychology. David B. Rosengren, PhD, is President and CEO of the Prevention Research Institute, a private nonprofit organization in Lexington, Kentucky. He is a clinical psychologist with a broad background in treatment, research, training, and administration. He has served as a research scientist and consultant at the University of Washington’s Alcohol and Drug Abuse Institute and as an MI consultant and trainer. 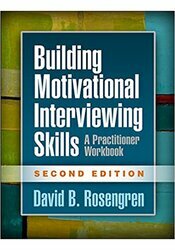 Dr. Rosengren helped to establish the Motivational Interviewing Network of Trainers, an international association representing more than a thousand MI trainers spread across 35 countries and six continents. His research interests include mechanisms of change for clients and practitioners, training methods, and implementation and dissemination science. He has authored journal articles and book chapters on addictions, MI, training, and the change process.